E-mail MeRoss A. Krajewski Esq. 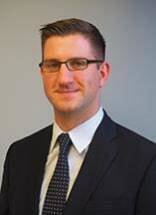 Attorney Ross A. Krajewski manages the Trust Administration Department at Cushing & Dolan, P.C. where he advises and supports trustees in fulfilling their fiduciary responsibilities and provides private client services to high and ultra-high net worth families and individuals. In this capacity, Ross works directly with individuals, families, fiduciaries, and their professional advisors to protect and grow trust assets while minimizing tax burdens and ensuring fiduciary compliance. While attending law school, Ross worked extensively in civil litigation for Thornton Law Firm LLP (formerly Thornton & Naumes LLP) and the firm of Corrigan, Johnson & Tutor, P.A. He is a combat veteran of Operation Iraqi Freedom and recently separated as a commissioned officer in the Massachusetts Army National Guard. Immediately prior to joining Cushing & Dolan, Ross worked in international military planning and multi-national training. Ross earned a Juris Doctor from Suffolk University Law School and a Bachelor of Science from Marquette University. He is currently enrolled in the Graduate Tax Program and Boston University Law School working towards his LLM in Taxation.